"Niacin modulates macrophage polarization in Parkinson's disease"
"TSH induces co-localization of TSH receptor and Na/K-ATPase in human erythrocytes." "Striosome-dendron bouquets highlight a unique striatonigral circuit targeting dopamine-containing neurons." "Homeostatic and injury-induced microglia behavior in the aging brain"
Educational Wave in cooperation with Institute of Physiology after L.A. Orbeli NAS RA has organized a program of youngster scientist school. The program is for children of 8 to 11. 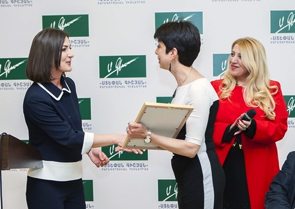 Interview with the Director of the Institute of Physiology after L.A. Orbeli NAS RA, Doctor of Biological Sciences Naira Aivazyan The article is in Russian. What is the effect of snake venom on Cancer cells? The results of the Armenian scientist's study. 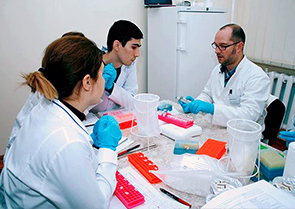 Narine Ghazaryan, PhD, Senior Researcher from L.A. Orbeli Institute of Physiology, Head of the Department of Molecular Biology at the Institute of Hematology, studies the anticancer effect of snake venom. The article is in Armenian. On 20th of December at 11:00 will be a presentation of researchers from Laboratory of Sensorimotor Integration and Integrative Biology. "Rhesus monkey neural stem cell transplantation promotes neural regeneration in rats with hippocampal lesions"
"Motor Behavior Mediated by Continuously Generated Dopaminergic Neurons in the Zebrafish Hypothalamus Recovers After Cell Ablation"
"TLR9 activation via microglial glucocorticoid receptors contributes to degeneration of midbrain dopamine neurons"
"Neogenesis of cerebellar Purkinje neurons from gene-marked bone marrow cells in vivo"
"Oxytocin stimulates hippocampal neurogenesis via oxytocin receptor expressed in CA3 pyramidal neurons"
"Light, Sound, nanoActors: Emerging Imaging and Therapeutic Technologies"
"Simple quantitative detection of mitochondrial superoxide production in live cells"
Elevated loop gain is/ is not a consequence of obstructive sleep apnoea. "Differential diagnosis of neurodegenerative diseases using structural MRI data"
The dominant mechanism causing disuse muscle atrophy is decreased protein synthesis/proteolysis. Говорит в интервью "ГА" директор Института физиологии НАН РА доктор биологических наук Наира АЙВАЗЯН․ "Голос Армении"
"β-Amyloid accumulation in the human brain after one night of sleep." Հերթական Journal club-ը տեղի կունենա Մարտի 22-ին։ Ելույթ կունենա ԿՆՀ ֆիզիոլոգիայի լաբորատորայի գիտաշխատող, կ․գ․թ․ Դիանա Թերզյանը։ "Болезни и изменения клеточного метаболизма"
1.Proton permeation through HV1 requires transient protonation of a conserved aspartate in the S1 transmembrane helix. Final Student Presentation. Hands-on Course on Tissue Engineering. Main Conference Room The Orbeli Institute of Physiology. Everyone is welcome! Most of the cardiovascular consequences of OSA are/are not due to increased sympathetic activity. В Институте физиологии НАН РА прошла научная конференция "Информационный потенциал биологических объектов", посвященная памяти братьев Орбели и приуроченная к 135-летию одного из основателей эволюционной физиологии, генерал-майора медицинской службы, вице-президента Академии наук СССР, члена нескольких европейских академий и научных обществ Леона Абгаровича Орбели. Ինստիտուտի գործունեության և նորարական ծրագրերի մասին “Առողջապահական համակարգ” մասնագիտական պարբերականը զրուցել է տնօրեն Նաիրա Այվազյանի հետ:.